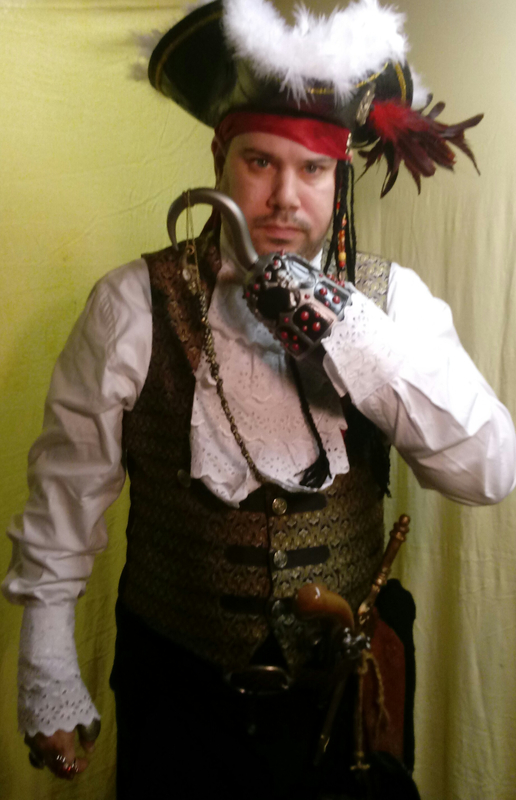 As a distraction from multiple surgeries this year, I decided my costume for my office Halloween party would be my version of Captain Hook. I have no professional training, other than being a lifelong artist and a bachelor's degree in graphic design. All items were either hand made, reworked thift store or dollar store items. Hat: Thrift store women's floppy hat. Recovered in patchwork pieces of leather, painted black. Stitched up to sides. Dollar store feather boa. Medallion on side was originally from a dollar store pirate necklace that was repainted and aged. Red feathers were from Michaels with my coupon. Scarf/ hair: Thrift store pirate scarf, braided yarn in front with hanging beads and yarn ponytail in back attached to scarf. Octopus button as an accent. Shirt: Men's white shirt seamed up front three-quarters of the way. Lace for cuffs and front piece made from a thrift store baby bassinet cover. Shirt is also from the thrift store. Vest: Original vest was from the thrift store. Front was decorated with ribbon and new buttons. Hanging button added to front and then a small Tick Tock crocodile watch fob ($3 on Ebay) was added to hang down with a chain from the vest. Sashes/ belt: Thrift store scarves and wide woven women's belt. Pants: Thrift store sleepwear pants and wide red trimmed shoelaces from the dollar store to tie them just below my knees. Boots: Men's cowboy boots from the thrift store a couple years ago for my red shirt Star Trek costume, repurposed for this. I made removable cuff sleeves from pleather and then decorated them with more octopus buttons and gold ribbon. Hook: made from reworked dollar store piece, dollar store adhesive half round plastic stickers, a small plastic flower pot I had, pvc couplings and more pleather with some scrap plastic guitar binding. Repainted also. Flintlock: Orange 50 cent thrift store find. Repainted in a burl pattern for the wood and aged silver for the "metal" with paint washes. Dagger: Dollar store, repainted and aged. Shrunked head: Started with the head from a dollar store hanging zombie for the base. Tissue and glue over, after reworking the features. Repainted with washes and Polynesian inspired face "tattoos". Toothpick nose "bone" splinter. Beads for accent and hair was from two dollar store princess hair extensions. Jewelry: A combination of dollar store rings, bracelets, thrift store pieces, etc. Some repainted, some altered and some reworked. The black beaded bracelet was the necklace portion from the dollar store pirate necklace wrapped around my wrist a few times. 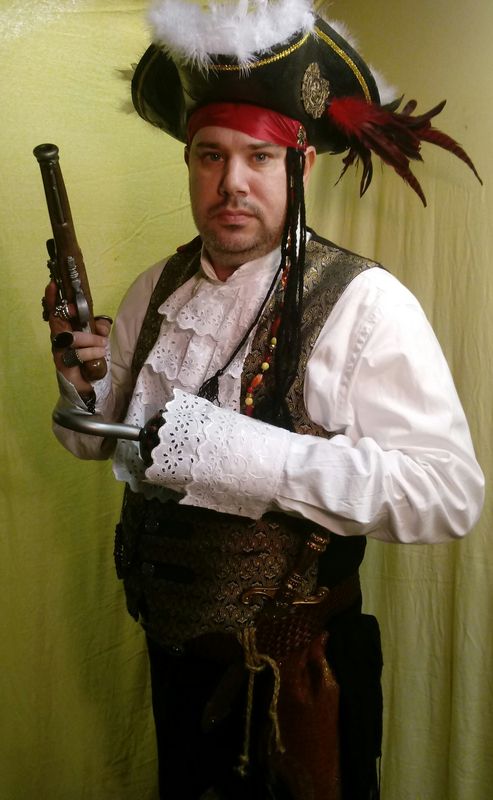 I had hoped to finish a few more accessories, including a spyglass from PVC pipe fittings and some scrap leather and other bits and a reworked and decorated red overcoat, but with my limited capabilities currently still I could only do this in little bits here and there. I will hopefully finish those pieces as I'm able to, then put them away with the rest for a future time. I hope you all like it, and I thank you for allowing me to participate.